Thatch Safe is a clear intumescent coating for exterior palm, reeds, bamboo, koa and tiki. ASTM E84 Class 'A' Rated; also passed NFPA 701. Apply 3 coats for finish coverage of 150 sq ft/gallon. Surfaces to be treated should be clean and dry. Thatch-Safe requires a 24 hour curing time before applying any overcoating for interior applications. Thatch-Safe should be applied in its undiluted state. Apply three (3) coats at 500 square feet per gallon, with the final coverage rate of 150 square feet per gallon to unfinished wood. Apply Thatch-Safe with a conventional or airless sprayer, brush or roller. Use on substrates that are enclosed and/or in areas that are warm and dry. Treat all surface areas where possible. If overcoating is intended, Thatch-Safe can be used as a surface primer for use under latex paints and permits surfaces to be tinted with water based stains. Thatch-Safe is an easy-to-use fire retardant coating for tiki huts, bamboo and other decorative reed materials. 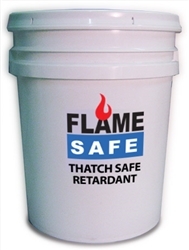 Intumescent coating swells and chars to create a thick layer of protection against spread of flame. Colorless and non-toxic. Comes with documentation for fire marshal. FS2 - Fire Retardant for Exterior 5 Gallons Contego Fire Retardant Paint & Primer - Multi-Purpose Intumescent - 5 gallons FX Lumber Guard retardant for Interior Wood - 1 quart BanFire Fire Retardant Spray for Fabric (NFPA 701 & CalFire) - 1 qt.